An automatic BBQ Temperature Controller will turn smoking mouthwatering BBQ into relaxing and hassle free activity. Whether your cookin’ up some competition BBQ or just trying to impress the neighbors, a temperature control device is seriously one of the best accessories around. With automatic fans, temperature probes, WiFi connectivity and the ability to fit a ton of different models and brands, you’ll be able to enjoy a beer and some conversation without constantly worrying about grill temperatures. We’ve scoured the internet for user reviews, recommendations and comparisons of all the best big green egg temperature controllers. We paid particular attention to online BBQ groups such as the smokingmeatforum, bbq-brethren and eggheadforum. Grill masters tend to gather and share their personal experiences on these forums for a true look into what works and what doesn’t. After all, experience of the many is better than experience of the few. When it was all said and done we were left with two clear winners and five more great alternatives. To illustrate which models are more popular with their pro’s, we’ve put together the below graph with their favorite Big Green Egg Temperature Controllers. 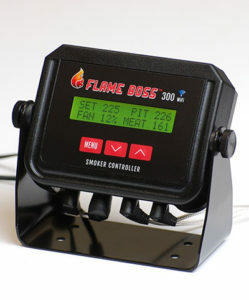 The majority of veteran BBQ gurus recommend using either the Flame Boss 200 WiFi or the DigiQ2. In particular, they prefer high quality controllers with built in temperature probes, easy installation, and reliable performance. Due to the versatility of these temperature controller kits, they will fit a ton of different models such as the Big Joe, the Big Green Egg and more. No matter which one you own, you’ll never be forced out in the cold to tend the grill again. 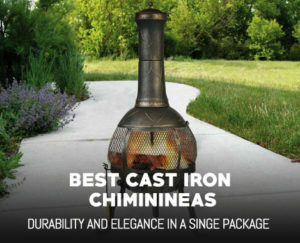 If you want a pre-built automated smoker solution, you might be interested in looking at some Camp Chef Pellet Grills as a great alternative to traditional charcoal smokers. Simply put, the Flame Boss 200 WiFi temperature controller is easy to use, super reliable, and most importantly budget friendly. Being able to change your pit temperature and adjust settings online is a lifesaver! Plus, with built in meat temperature alarms, the Flame Boss 200 will send you a text so you’ll never mess up another brisket again. Professional BBQ’ers found the included circulation fan did an excellent job of holding the desired temperature. Even more, the open lid detection prevents the fan from over stoking the fire when you just want to peek at your delicious creation. A small percentage of users noted they did have some trouble setting up the WiFi. However, once you get it up and running, you’ll be good to go for years of use. Almost like cheating, except there’s no cheating in backyard smoking, just good eats! A few veteran competition smokers also pointed out that the Flame Boss 300 fan was slightly more efficient than the BBQ Guru – DigiQ DX2. In reality though, they both use so little energy that a slight difference won’t affect the taste or power usage. Another common theme you’ll find among all Gig Green Egg temperature controllers are failed temperature probes. When you stick a small piece of metal into a hot fire for hours at a time, some are bound to run into issues. The good news is Flame Boss as excellent technical and customer support and will ship you a new one in no time. Overall, if you’ve got a busy life and can’t dedicated 15 hours to baby a brisket, the Flame Boss 300 WiFi is for you. 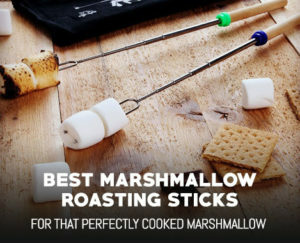 It’ll make your life a hell of a lot easier, prevent wasting money on overcooked meat and will make the neighbors jealous of your BBQ mastery. The BBQ Guru DigiQ DX2 is the easiest Big Green Egg temperature controller to set up, bar none. With no fancy WiFi or voice controls, it does one job and it does it extremely well. If all you’re looking for is a bare bones, high performance controller, this is the one to get. Whether your cooking a brisket at 250 F for 15 hours or just some chicken for a weekend BBQ, the DigiQ has you covered. It makes maintaining constant temperatures as simple as pushing a button. Plus, a quick check of the LCD screen will tell you real time temperatures while an audible alarm will signal it’s time for you to grab some plates. One of the fears many first time smoker temperature controller users have is “what if it doesn’t work”? To be honest, for the first couple of cooks, it’ll be hard to trust it. You’ll still want to check in every 20 minutes and maybe even sneak a peek under the lid. But seriously, just let it be, it’s going to work. The BBQ Guru DigiQ DX2 is a superb piece of equipment and with its slightly higher price, you know you’re getting a quality product. Plus, it’s got a host of built in safety features such as audible excess heat alarms in case your coals are getting out of control. Another thing to note is don’t waste money on branded big green egg one, this is the same thing for much cheaper. Additionally, if you absolutely need WiFi functionality and prefer the BBQ Branded products, take a look at the CyberQ big green egg temperature controller below. It’s nearly identical to the DigiQ, but also offer the latest in modern wireless technology at only $100 more. Simply put, the BBQ Guru DigiQ DX2 works as advertised. It’s great for a low and slow overnight cook and can be trusted to last for many season to come. Whether you decided to go with this temperature controller or the slightly more popular Flame Boss 200 WiFi, we can guarantee that after your first bite of BBQ, you won’t regret spending the money. 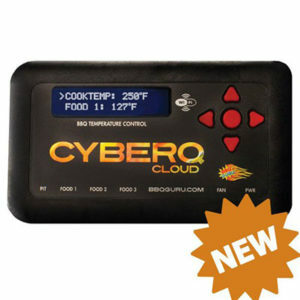 The new BBQ Guru CyberQ offers the latest in smoker temperature controller technology. With effortless WiFi connectivity, a full set of probes, tons of adapters and even a convenient carrying bag, it is a beast in the backyard. Have you ever had to quickly run to the store with some meat on the grill and leave another family member in charge? From experience, I know it can be a stressful trip. Enter the CyberQ, with email, text and audio food alerts, you’ll never have to worry about telling your kids of significant other to watch the grill again. Just pick up your phone and get immediate peace of mind. As the newest addition to BBQ Gurus lineup of Big Green Egg temperature controller, the CyberQ is an upgrade over the DigiQ DX2. However, as with all new products there were originally some growing pains. Users complained of unstable WiFi connectivity and multiple failed temperature probes. Talking with recent owners, we found most of these issues have been resolved, but an occasional reset may still be needed. The upside is that you can easily share your cook performance and recipes with friends using an online cloud based system. Additionally, installing the unit, as with most controllers, is very quick and straightforward. Plus, being able to access all of your data from a smartphone, table, desktop or laptop is just the cherry on top. Overall, if your after the latest and greatest and don’t mind paying a premium for it, the BBQ Guru CyberQ should be right up your alley. With advanced data metrics, reliable performance and easy installation, this is your ticket to mouthwatering BBQ. – Fits: Big Green Egg (M, L, XL, XXL), Big Steel Kegs (all), Bubba Kegs (all), Kamado Joe (Big & Classic), Primo (all models), Costco Phase II Vision, any kamado with sliding lower vent door height between 2-3/4″ and 3-3/4″. The Pitmaster IQ BBQ temperature controller is an ultra low budget option for those who don’t want to burn a hole in their pocket. Similar to how propane burners have a fuel control knob, the Pitmaster IQ is the charcoal smoker equivalent. It’s easy to setup, simple to operate and while not the highest quality piece of equipment, it will certainly get the job done. One of the most impressive benefits of the Pitmaster IQ smoker temperature controller is the sheer number of models it fits. Aside from the ones listed above, Pitmaster makes separate kits for the following grills. So you might be asking, why is the Pitmaster IQ so cheap, but still so well reviewed? The answer, is the lack of a dedicated meat probe. This unit will only look at the temperature of the pit and does not interact with the meat. In other words, it won’t know when your BBQ is done but it will keep the temperature consistent. While not ideal for some folks, if that’s all you’re really looking for, it’s a winner. Even better, it only takes 10 minutes to install and won’t leave you scratching your head. Plus, if you’re on the road, it has an optional 12VDC cigarette lighter socket sold separately so you can power it from a vehicle or portable charger. Overall, this is a good quality BBQ temperature controller for a super low price tag. It’s control knob might not be quite as accurate as the more expensive LCD screens, but once dialed in, it’ll work flawlessly. If you don’t need all the bells and whistles of the higher cost options, the Pitmaster IQ will make a great addition to your backyard smoker. 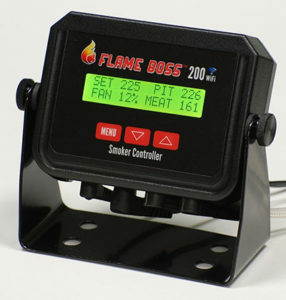 The Flame Boss 300 can easily go toe to toe with the CyberQ for the best WiFi temperature controller on the market. Comparing them apples to apples, it’s a very close race. Especially considering they each have WiFi capabilities, multiple probes and can reliably maintain a consistent temperature. The only advantage the CyberQ has over the Flame Boss 300 WiFi is fitting more ceramic smokers and brands. The Flame Boss simply doesn’t have as many adapters out there yet and may have trouble mounting to lesser known smokers. However if your smoker is compatible, then the choice is really up to you as to which is better. Put it to use right away – it is fantastic! One of the things that users loved about this unit was the “upgrade” kit. If you decided to purchase the Flame Boss 300 WiFi w/ Extras, it’ll come with two additional meat probes so you can track a total of three different pieces of meat for that perfect cook. With other controllers, you’ll need to purchase off brand probes or pay super high prices for standalone units. Overall, the Flame Boss 300 WiFi is a top notch unit and performs incredibly well. If you can find it cheaper than the CyberQ cloud we’d say go for it. If instead they are at the same price, just go with the brand you feel more comfortable with, assuming it fits your smoker model. When it comes to the best BBQ temperature controller on the market, this is a strong contender. When it comes to budget BBQ temperature controllers, the BBQ Guru PartyQ is a home run. With an ultra low price tag, excellent performance, and a small form factor it’s everything it needs to be and more. One of the defining characteristics of the PartyQ is that it’s a battery operated, portable, lightweight option in a world filled with bulky plug in units. This makes it’s perfect for camping trips, outdoor picnics and remote cookouts where dedicated power might be a concern. Similar to the more expensive BBQ temperature controllers on our list the PartyQ does an excellent job of removing unstable smoker temperature swings. This results in juicier, more tender and overall more flavorful meat. Plus, at such a low price, it’s hard to pass up if you’ve been putting off the more expensive units. Long time users were pleased to note that with 4 AA batteries, you can expect around 20+ hours of run time. This is great for those long overnight smokes and give you some extra float time in case something goes wrong. However, it does chew through batteries if you like to cook a lot. As such, we’d recommend you grab a set of rechargeable AA batteries. They are more expensive up front, but will save you a tone of money in the long run. If you’re really serious about smoking meat, just go for the Flame Boss 200 WiFi. The dedicated power cord will make your life a lot easier, assuming you don’t need the portability of the PartyQ. Another minor complaint with this unit is the lack of a fan pause button. When you open your big green egg lid, the fan will keep running and raise the temperature. Simply turning the unit off for a few seconds is an easy workaround however. 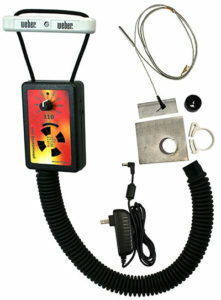 Overall, the BBQ Guru PartyQ is a great low cost BBQ temperature controller. It’s got the features, reliability and build quality of a much more expensive unit. While it doesn’t come with WiFi comparability you can always pair it with your favorite wireless thermometer for a solid smoker temperature control system. I’m sure many of you have been wondering why the Stoker wasn’t higher up on the list, especially considering it was ranked the third best BBQ temperature controller by long time BBQ experts. The simple answer is it’s too hard to set up and use. While it has nearly every feature you could ever want, it is more of a DIY special type device. Advanced setup, tinkering and constant fiddling are a common theme among Stoker II owners. For a general backyard chef, it’s not worth the hassle and is a bit of an overkill. The CyberQ has got almost the same level of features and is much easier to get up and running. If you really want to take the hard route, you can check out their website and looking into building your own kit and it doesn’t come in a single package.